I tuned into Radio 5 live this morning around 6.20am and there was my old pal Nicky Campbell discussing whether William Hague or Ken Clarke would make a good successor to George Osborne. Has the Conservative Shadow Chancellor resigned overnight then? Nope – just some tactical undermining by the BBC. I then tuned into Radio 4 “Today” and there was James Naughtie discussing…whether William Hague of Ken Clarke would make a good successor to George Osborne. Why it’s deja-vu all over again! Mind you, to be fair, the BBC does suggest that whilst Ken Clarke would be popular in some quarters (I.E. Left wing media like itself) he carries echoes off those foul Thatcher years so sorry Ken, even though the Beeb might like you but they still won’t back you against their Labour pimps! After sitting back for MONTHS and watching the Pound plummet in value, the BBC now appears to believe that only Osborne carries the can for such financial devastation. Miraculously, McCavity is absolved from any culpability. Isn’t it swell to have a pro-government broadcasting corporation? By Ed Thomas | November 16, 2008 - 12:17 pm | November 11, 2012 andrew marr, anti-conservative, Get Osborne, save gordon. Sums it all up really- not the reality, that is, but the BBC’s preferred narrative. Alexander- the Secretary of State for International Development- was there to demonstrate how (in accordance with the Brown narrative) the crisis is global, first, and we are the victims, second, while John Reid was there to show how he was burying the hatchet and uniting behind Brown and to blame Osborne for not doing the same. In fact Osborne performed superbly on the Marr programme, so despite Marr’s repeated attempts to bring up the world crisis in defending Brown, Osborne swept past him. Yet is he actually winning this argument? Difficult to say, because the BBC has so relentlessly depicted him as on the defensive, the “George Osborne under attack” meme. This has been partly justified by bringing up a so-called convention regarding commenting on Sterling which, as the commenters at B-BBC have noted, is bogus. Meanwhile David in the comments points to this article as a related note, where Brown “regrets” Osborne’s comments highlighting the risk to the pound. Surely in fact Brown regrets that his economic incompetence is being exposed? It is no good his shaking his head over that unpublic-spirited Osborne- it is Brown who has been frantically trying to look competent in situations he has been instrumental in creating. So far he has done only the most obvious things, like bail out faltering banks, huddle with world leaders and pronounce “routemaps” as he poses for photos. Earlier I saw an BBC online article where Gordon was shown in a decidedly odd picture (actually used above) at the G20 meeting towering over the Russian President, the Russian’s eyes upraised to meet Gordon’s (ie. 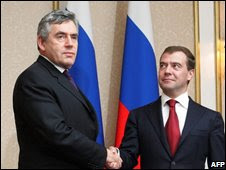 where on earth was Gordon standing in relation to Medvedev? [Update: apparently Medvedev is unusually small. This does not explain the particular photo with Gordon facing the camera and Medvedev looking up to his eyes, or indeed the very choice of this photo- why these two men and only them? Generally I think the BBC’s photo-story-telling is abysmal]). In a more sensible world Brown wouldn’t even have been able to take the reins of the Government a year and a half ago because his incompetence over boom and bust would have already been made apparent by a sentient fourth estate (Labour’s favourite bank Northern Rock was melting away as they feted Gordon). Instead, those who have the temerity to question the inevitably compromised economic wisdom of Gordon Brown are put in the media dock by the BBC-led media. Meanwhile, Guido points to yet another angleof BBC bias in favour of Brown.